Back in the year 2000, I remember having a short discussion with my father about the upcoming presidential election. We never talked about politics much because I suspected we might have differing opinions, even though I was pretty sure he was an independent with a bit of a lean to the right. I had always thought discussing politics something we might want to avoid. But this particular day, he mentioned to me that it was “time for a change”. This meant that because of all the scandal during the Clinton administration, which must have really disgusted a lot of people of that generation, it was time to throw the Democrats out. People all over were saying it, that it was time for a change. It was a phrase circulated, spread from conversation to conversation, and it started me thinking about those kinds of phrases and how they become important, if said often enough, and can affect elections, which of course, is the desired outcome. Naturally I had to write about it in my new novel, out this spring (self-promotion alert! ), Perigee Moon. Gertie and Randy didn’t seem to be too well-informed and could make no real valid arguments that defended their position that it was “time for a change”. When asked exactly why that would be they could only point to the Lewinsky Matter. 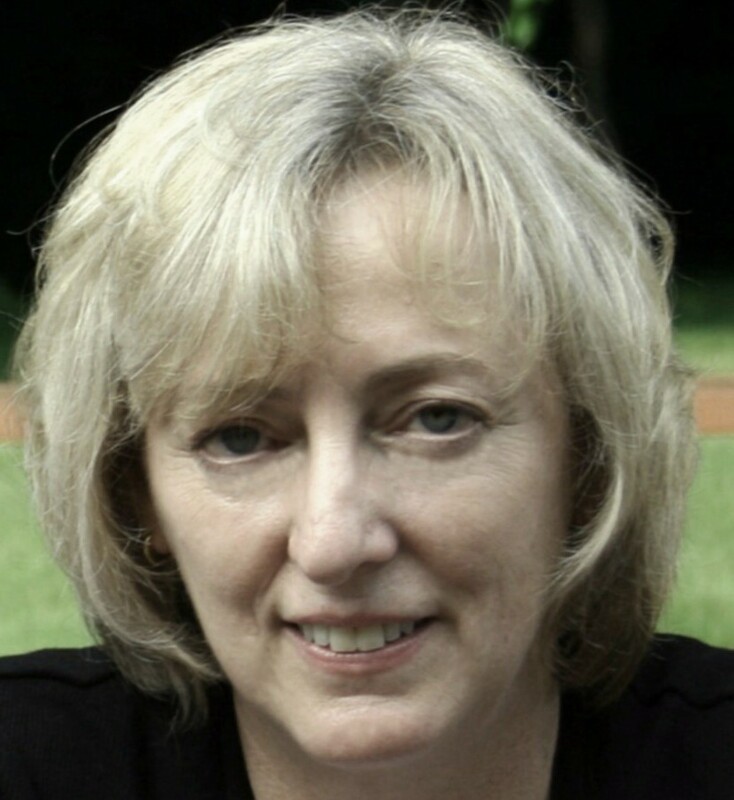 So it would seem that no matter that Mr. Clinton was an adept politician and had kept the peace for eight years and balanced the budget and governed rather well, the fact that one naïve girl, rather sluttily inclined, could tempt and tease and torment a man who, as are many powerful men, might be more sexual in nature than the average eight-to-fiver, it was still time for a change. Luke saw this, in that instant, that people around dinner tables all over the country were saying the same thing that Gertie and Randy had just said. “Al Gore is going to get screwed, because of Clinton,” Luke said. Obama is bad for our country. Okay. Just how is he bad for our country, could you elaborate on that please? No, he’s just Bad. Bad for Our Country. 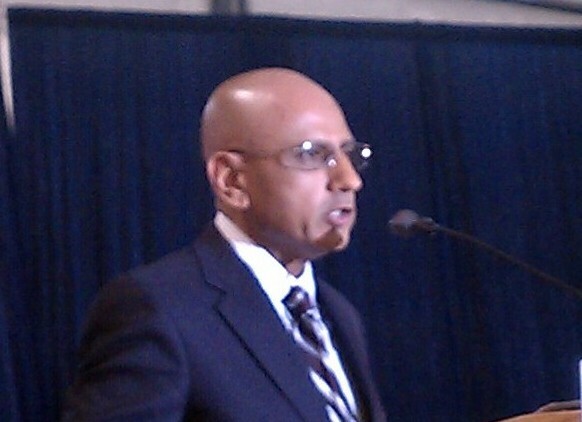 We must take our country back. From whom must we take it back? The House of Representatives is controlled by the Republicans. The Senate is split pretty evenly. The Supreme Court, even though they are directed not to, seems to be a little top-heavy which is causing that right lean. Yes, the President is a Democrat so I guess we need to take the country back from him. This is not meant to be a political blog, it’s a blog about writing. 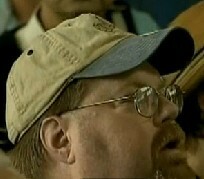 I was interested in the way phrases circulate and people begin to say them, without knowing why they are saying them. And besides I like to throw a bit of politics into my novels occasionally. 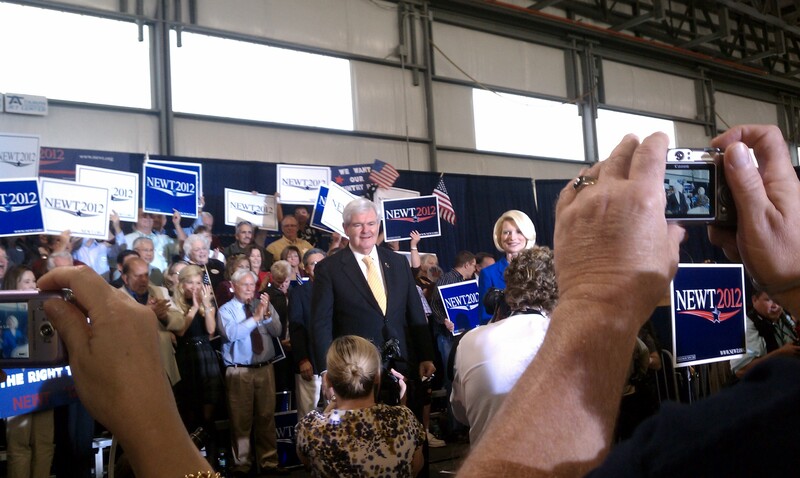 Recently, I went to a Newt Gingrich Rally. There are many reasons one would attend such a rally. 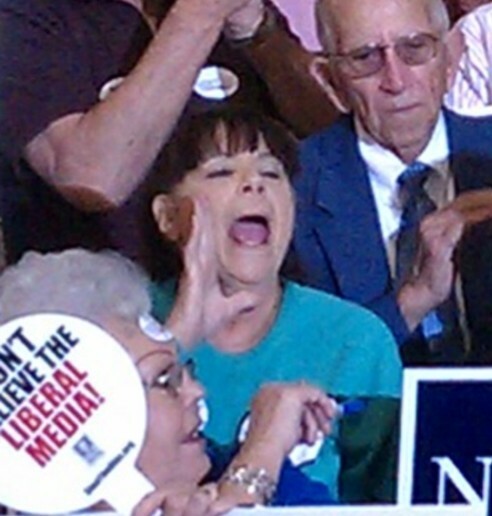 One is a die-hard Newt supporter and wants to yell and scream so Newt knows someone loves him. 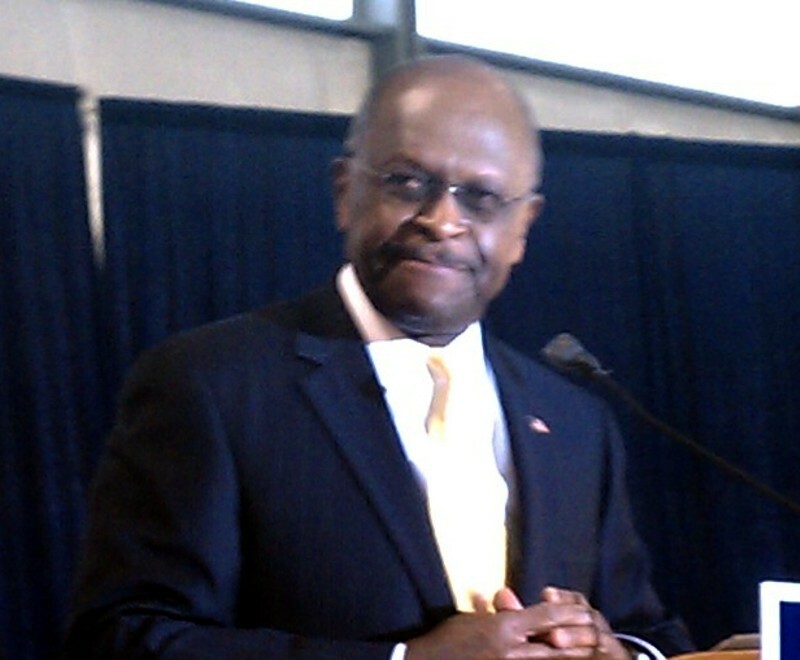 One is a supporter of Mitt Romney and is out to gather information, which can be used against Newt in the future. One is an Independent voter and is out to become educated about each of the two men, one of which will surely be the Republican Nominee. 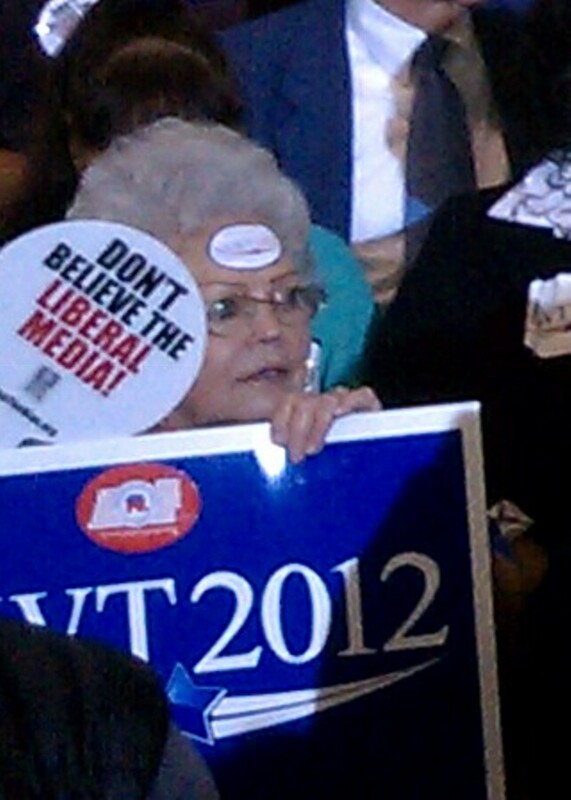 One is an Obama supporter but wants Newt to win because they believe he will be easier for Obama to beat in November. One who has nothing else to do but visit an airplane hangar on a 75-degree day in Florida. One who wants to see Callista’s hair up close. Because I don’t want to offend any readers of my blog who might be of a different political persuasion, I will refrain from saying which category I fall into, except 6 for sure. 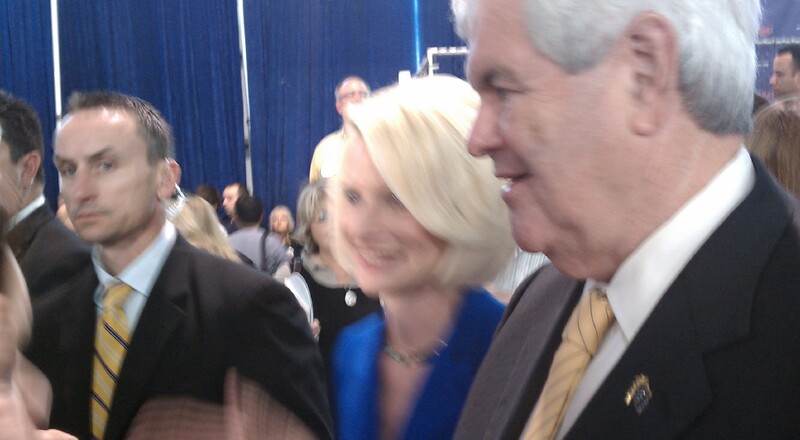 The turnout was disappointing, only 300 or so supporters or “supporters”, but we got to get pretty up close and personal to Newt and Callista, who was wearing a beautiful shade of blue suit that day. We were stopped outside and interviewed by CBS who, while they paraphrased what my husband said, they did not show him on TV. This was a big disappointment but I’m pretty sure they liked what he said, which was, “With Newt, what you see is what you get. 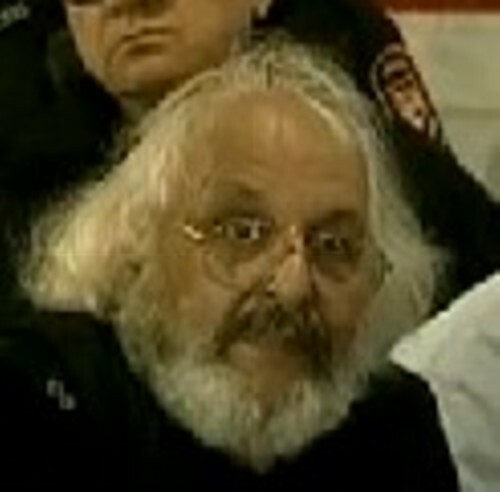 If he’s elected he won’t flirt with liberals.” And he also said, when asked about Newt’s marriage baggage, that “we are Christians and as such we believe in redemption.” Now, this may or may not be the true feelings of my husband, depending on his reasons (see above) for attending the Newt Rally. I turned to a woman and acted dumb. “What’s that?” I asked, meaning SOX. “It’s got something to do with Medicare,” she said. Well, actually not. People are clapping and yelling to repeal something and they don’t know what it is they are repealing. That’s okay, it must be good. Newt says we should repeal it. 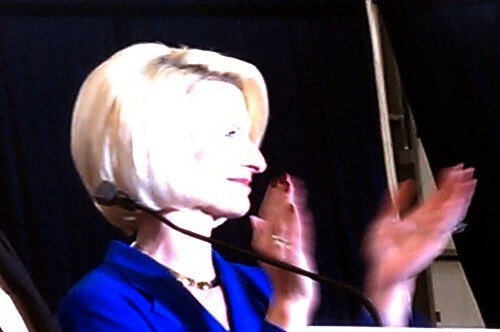 Callista clapped at everything Newt said. 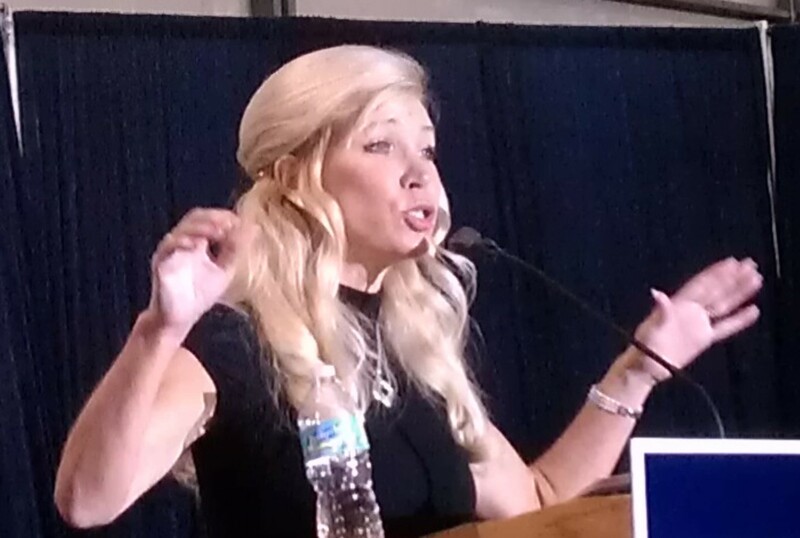 You can’t see it here, but the rock on her hand sparkled while she was clapping. Damn phone cameras aren’t worth much, they can’t even capture the flash of a multi-carat. 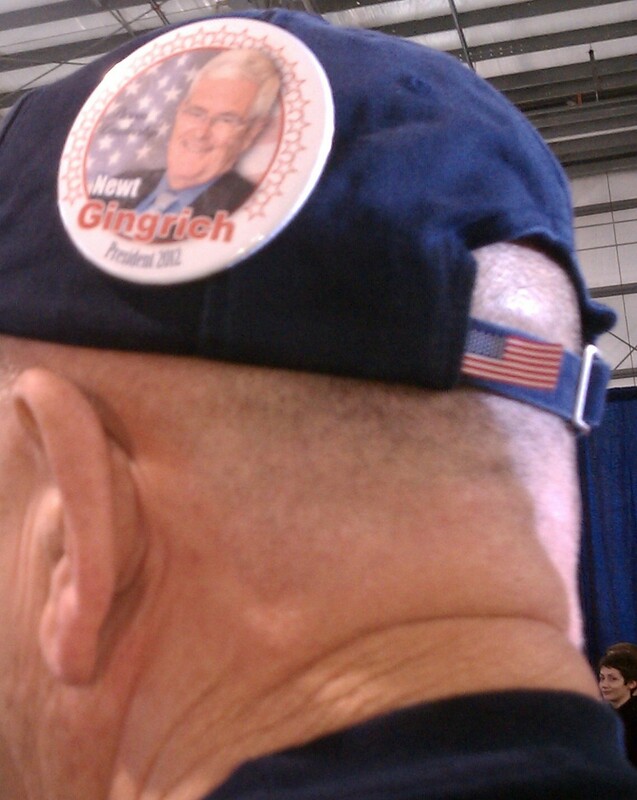 Other observations at the Newt Gingrich Rally. 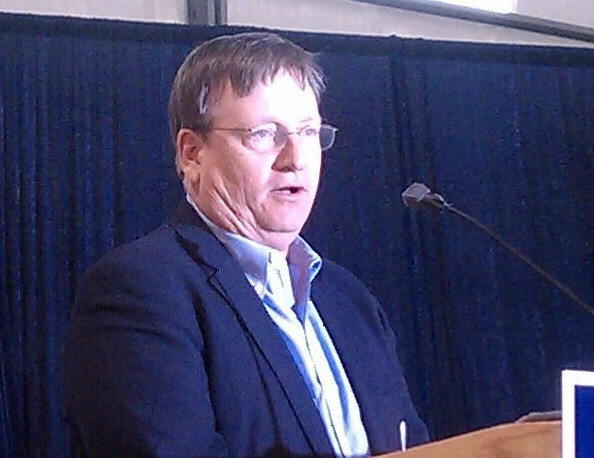 Is this Michael Moore? 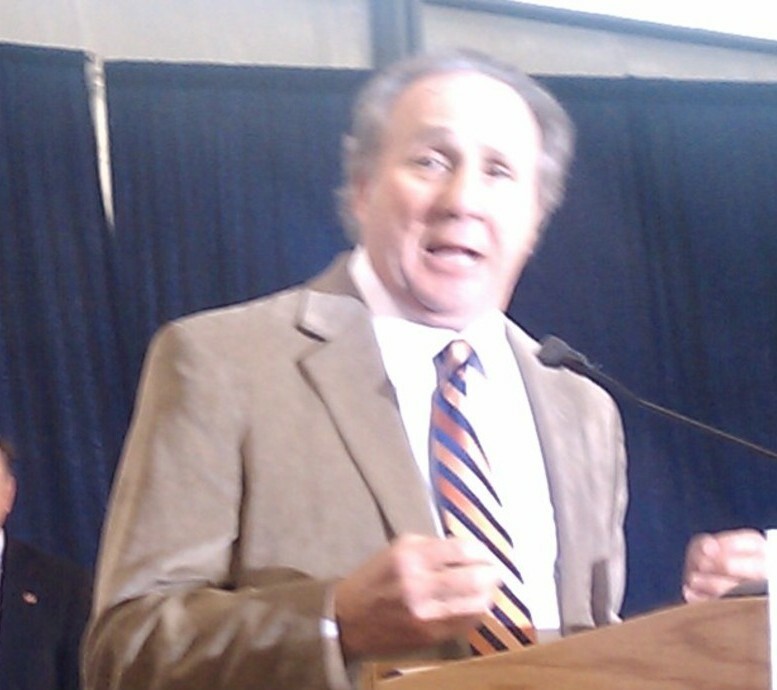 What’s he doing here? I don’t think this person is a Republican, do you? 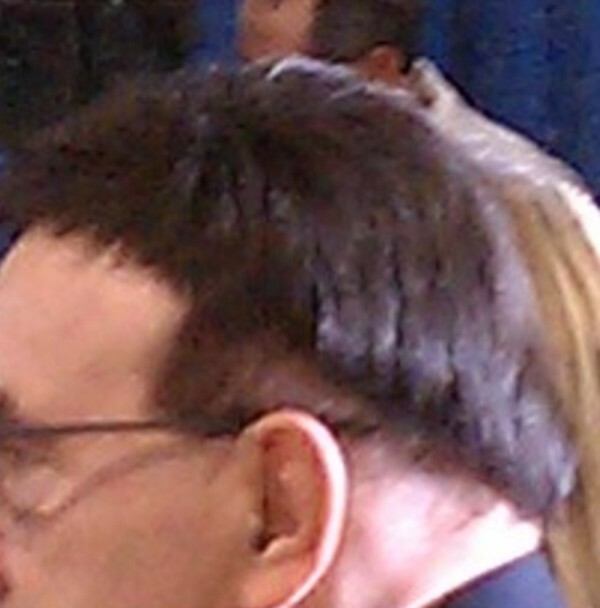 This guy looks like his rug shrunk. Aren’t those square pieces supposed to go in front of the ears? I think this is Barbara Bush, but I’m not sure. 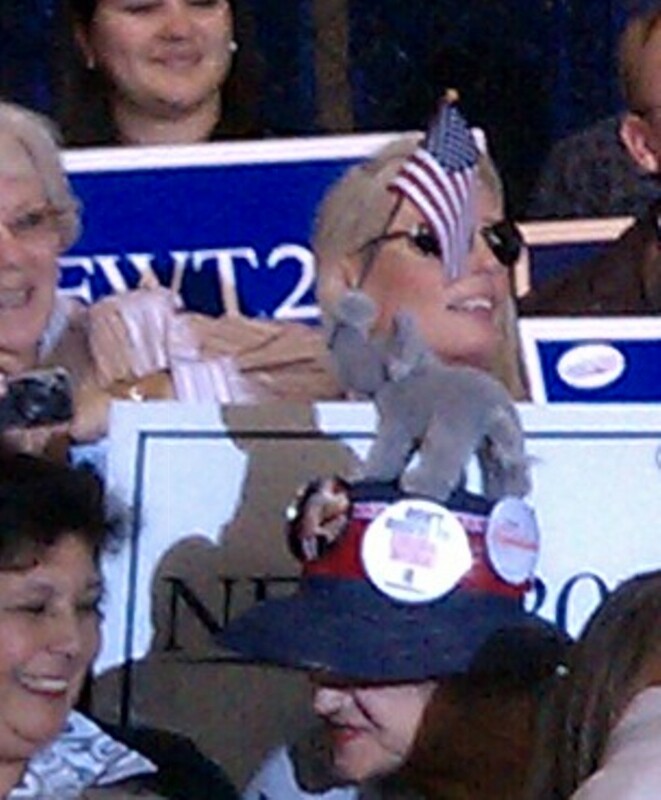 Here’s a nice elephant hat, complete with American flag. And that’s Tiger’s ex-wife behind her there. Does this man have pants on? Is this Viggo Mortenson? If only I’d known he was going to be here, I’d have worn my I Love Viggo pin. It’s Stephen Colbert! Are we going to be on the Report? 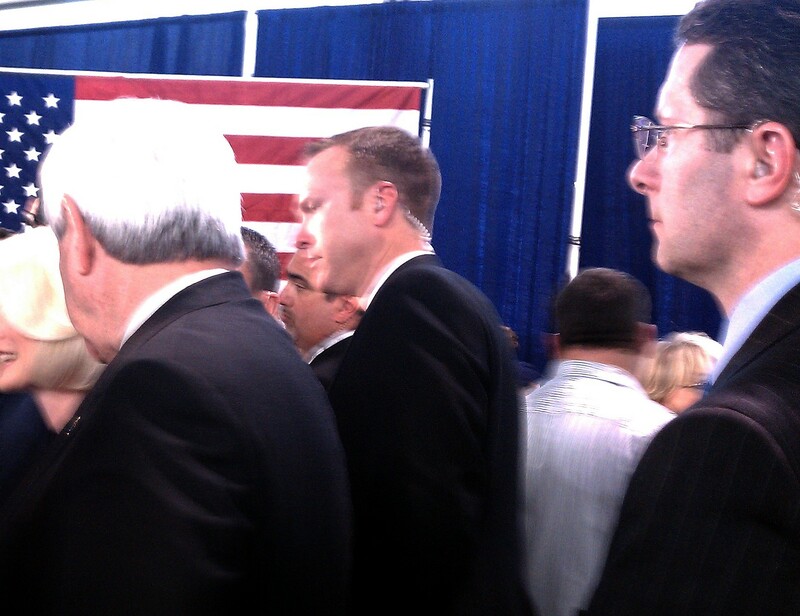 Alas, Newt did not take Florida. 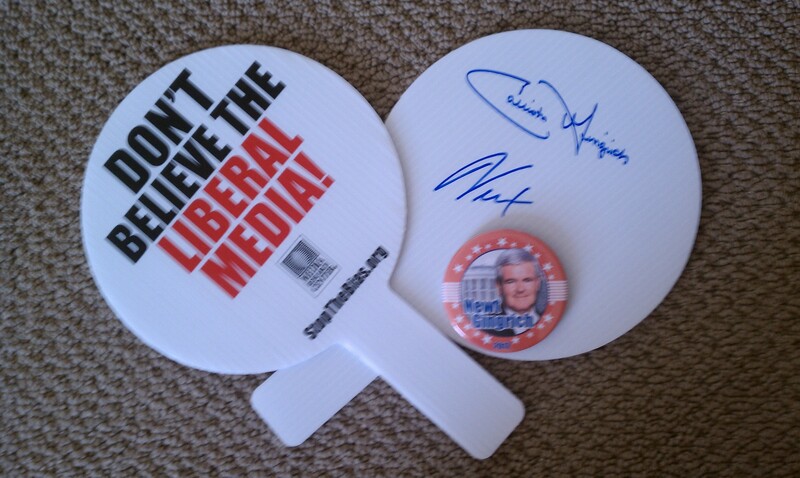 But I did get both his and Callista’s autograph on the back of my “DON’T BELIEVE THE LIBERAL MEDIA!” fan. 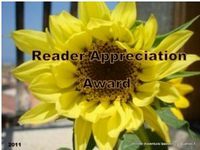 Disclaimer: The people in these photos may or may not be who they are depicted to be by their labels, which may or may not be misleading, and should be left to the discretion of the viewer and/or reader to discern if they are or are not, who they are or are not.